Find the best way to store these flowers to keep them intact and dust free. 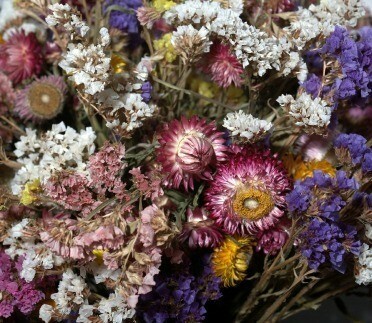 This guide is about storing dried flowers. I dry my own flowers for crafts and arrangements, but need a way to keep them organized and undamaged. Take a look at the grocery store at the boxes that cakes and pastries come in. Our local store sells a dozen croissants in a nifty hinged re-sealable clear plastic box, for instance. They also sell cookies in re-sealable clear plastic boxes. These types of containers would be good ones for storing things that would easily crush. So you would get 2 greenie points for using them, one from your kids for the contents and one for re-using.